Earthjustice is fighting to protect the wolverine, a tough-as-nails creature that’s nevertheless extremely vulnerable to climate change and development. Once decimated by traps and poison, only a few hundred wolverines remained at the turn of this century when Tim Preso, the managing attorney of Earthjustice's Northern Rockies office, took up their cause against unsympathetic state governments and the George W. Bush administration. After many years and court battles, in February 2013 the federal government proposed to protect the wolverine as a threatened species under the Endangered Species Act. Unfortunately, the government failed to follow through on that proposal, instead acquiescing to state objections in 2014 by issuing a decision to withdraw the proposed listing. Now Earthjustice is back in court with a legal challenge to that decision. Our aim is to provide the wolverine the legal protections it needs to withstand a host of threats, including a warming climate that is literally melting away the wolverine’s snowy habitat. We spoke with Doug Chadwick, author of The Wolverine Way, to help understand the exceptional nature of the wolverine and its vulnerability in the face of climate change. Jessica Knoblauch: When did you first hear about wolverines? Doug Chadwick: I was about 16, living in Alaska, and a fellow I met there looked like he had run into a Cuisinart mixer. It turns out that he had trapped a wolverine, clubbed it in the head and then began carrying it back to camp with its paws bound together and looped over his head. As you can probably guess, it turned out the wolverine wasn’t dead. Jessica: Whoa. That’s intense! So most people are not familiar with wolverines. Why do we know so little about them? Doug: Until we had GPS technology, I don’t know anybody alive that could keep up with a wolverine for 24 hours. These are 30-pound animals that are only three feet long, and yet they have home ranges the size of a grizzly bear. We’re talking 400 to 500 square miles for males, and about half of that range for females. And, they’re going up peaks and through passes and along cliff faces. Chadwick holds a tagged wolverine. The other reason we don’t know much about them is because they’re very territorial, so you can’t fit very many of these wide-ranging animals into one spot. Even a place as big as Glacier Park, which is 1,500 square miles, only has between 30 and 45 wolverines. That same park has an estimated 340 grizzly bears living in it. That tells you something very important about wolverines, which is you need connections between existing wild lands for the population as a whole to endure over time. The wolverine is reminding us of something that really applies to almost all of the big, wide-ranging animals, which is that we must link these preserved areas together so that their genes can flow across the landscape. Doug: There’s plenty of wildlife to hunt in the Rockies, but they’re found more down on south-facing slopes, away from the wolverines. So what are the wolverines living on? Well, the answer seems to be food they have cached during the warm months when the big critters are up in the high country. It could be something they killed or something that a cougar or grizzly bear killed months ago. The wolverine carries off pieces of it and stores it in snow banks during the summer or puts pieces under boulders that have cold water running under them. It has food stored in all these natural refrigerators, and it can come back six months later in January or February and grab this stashed food. Wolverines can also crunch bones. They have very strong jaws, and we would find autopsied wolverines whose stomachs felt like they were full of gravel because they were full of bones. Most importantly, wolverines have this attitude where they will walk up to a grizzly that has a carcass they want and say, “That’s mine.” They start issuing this wolverine growl that sounds like a Harley Davidson mating with a chainsaw, and it's real velociraptor quality stuff. Jessica: So they can be quite ferocious? Doug: There are lots of stories of how they attack people but no one has ever been able to trace down a true story of that happening. But if you do corner one in a trap, they turn into the wolverine of myth. They’re like caged plutonium. They just keep coming at you, and they’re growling and they’ve got saliva coming out of their mouths, so you can kind of see where the assumption comes from about wolverines being vicious. One time I was doing a story for National Geographic on endangered species and somebody asked me, “Do you want to come and see something interesting?” Of course, I said yes, and the guy leads me to about a half-acre pen where there are a ton of wolverines inside. He asks, “Do you want to go in?” And I’m thinking, “No.” But we did go in, and I see these wolverines rolling around together like puppies and playing with each other in big furry balls and then they come scampering over to see us. Right then, I came to the conclusion that there was a lot more to these critters than I’ve heard from all the old frontier tales. One reason I was eager to find out more about them was that, like so many animals, the more we know about wolverines, the more the old image changes. They turn out to have dimensions we never guessed, and they turn out to be way more fascinating. 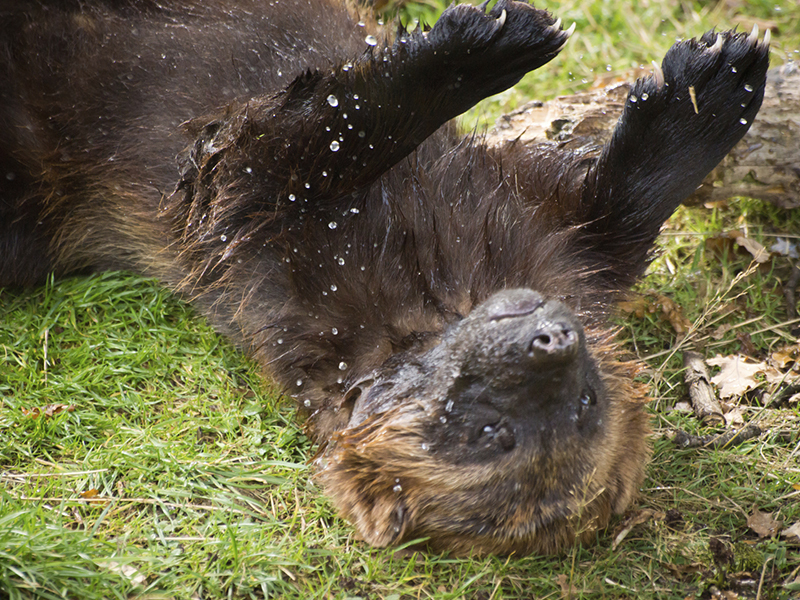 Wolverines are more complex animals than their reputations give them credit for. Jessica: How does climate change affect wolverines? Doug: Females require deep, persistent snowpack to raise their young from February through May, and they don’t tend to tolerate warm temperatures very well. As scientists model various climate regimes, they have predicted that wolverines are going to lose perhaps a third of their existing range in the U.S. by 2050. When people hear about wildlife and climate change, I think the standard thinking is, “Oh boy, the polar bear and maybe the caribou up in the Arctic are going to have a real problem.” We think of the shrinking ice cap. But now we have an animal, the wolverine, that’s very closely tied to climate, that lives in the Rockies, and it’s telling us the same thing. Jessica: Tell me about the wolverine called M3. In the course of doing all this, he climbed the highest peak in Glacier, which is 10,460 feet. And he completed the last vertical mile in 90 minutes, up a rock face that looks like it’s the world’s steepest, longest ski jump. People subsequently tried to do what they called the M3 route. They went about a third of the way up and bailed. Other wolverines have done similar exploits. And why are they doing this? I really don’t know, but I know they do it regularly, and I know it’s a big part of their lifestyle. That’s one of the reasons I call them inspiring. If you can master the mountains like that, you’re my heroes. 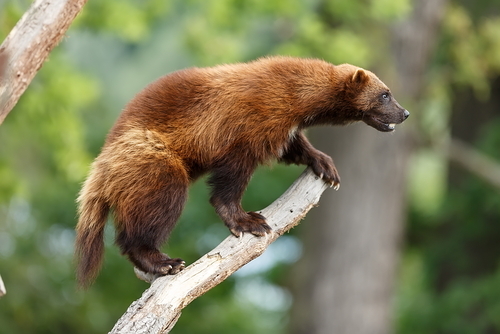 Wolverines spend much of their time climbing. Jessica: In your most recent book, The Wolverine Way, you talk about the wolverine’s approach to life. Can you describe what that is? Doug: It’s basically climb everything, whether it’s trees, cliffs, avalanche chutes; eat everything, whether it’s small, large, alive, dead; and never back down, even from a mountain and least of all from a grizzly bear. I think they live life as fiercely and relentlessly as anyone has ever lived. Personally, I can’t imagine living in a world where we give up animals like this, these great creations. What are we saving nature for if we can’t keep critters like this? This interview originally appeared as a Down to Earth podcast in 2014. Listen to the full interview here.